New Year – Chaos is Forever!!! Last month of 2008 running upto the new year was very eventful ,queer and mundane things alike.Quite of few of these threatened to be blogworthy; I just thought I’ll spare anyone reading this the trauma by cramming it all in a single post. And timeline it. Dec 6 : Holid ay mood has set in.Getting my hands dirty in the kitchen. 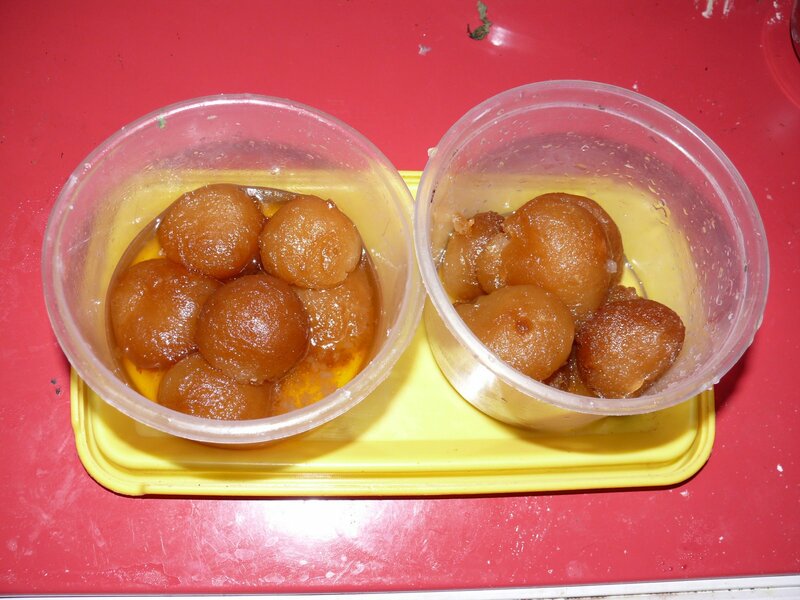 Made Gulab Jamuns and carried them to office, a visitor of course. Soaked more oil than they should’ve but still tasted yummy,or that’s what everyone said. The unfortunate lot,here, the jamuns, on the left. Dec 8 : Left for Hyderabad. My ticket story happened. Please stop drooling now. The Jamuns are history. Dec 9: Went to Shilparamam, a crafts village situated few kms from Hyderabad. A charming visit .Traditional souvenirs, handicrafts, exhibitions of art and dance forms are what you will find here. Pics here. Dec 12 : First day First show of Rab Ne….A moderate achievement I will say(Justification for adding it here). Read the review. Dec 14: Cousin’s engagement in Gulbarga. Even my 12-year old nephew didn’t deprive himself of the joy of pulling my leg (You next,you next). Very eagerly awaiting the wedding :P My cousin’s wedding of course, you <swear word of your choice HERE>! Dec 25: Guess Santa Claus was short of cash this Christmas. I got pickpocketed while on the infamous No.201 Bus. Wallet with some cash and all cards. The cop said an FIR can’t be raised because my jeans rear pocket was not torn.When asked what I study, I committed the unatonable sin of telling him I am Software-u. Gita Parayana followed,Kannada-cop-style. No pics,not here,not anywhere. Dec 29: Long holiday gets over. Joined new Software-u .The environment is cool.People are nice. And evening snacks are free. Dec 31/Jan 1st : Welcomed the new year with a party involving the only all-teetotaler new year party in town.Dancing was strictly prohibited. Instead as the new year dawned, we were trying to decipher why the evil Italian doctor cut the Italian zombie’s hand and if the Italian cannibals are really evil or they just plain bored.Movie in question : Zombi Holocaust – The Cult Italian Movie. Watch it for the laughs. And some stomach-curdling gore action while munching popcorn. (Seriously,don’t watch). Then we discussed forthcoming trips, watched youtube videos and Argh…Golmaal Returns. We are not demented.We choose stupid movies on purpose,for laughs. Amazing new year party! And then it was the first morning of the new year…. I slept. Bas Ek haan Kiiii Guzarish…. As a passing note, I wish & hope India has a great year too. 2008 has been a rough year. Lessons learnt; 2009 better be good! “I am not going to give up…I am not taking back my words… Ore wa ninjo da (This is my way of the ninja)“…. Rasengan!! !